Qfuse AppConnect allows users to simply scan a QR code or NFC tag and get taken directly to your app download page -- no searching, no guesswork, and no distractions. Qfuse provides an all-in-one platform that makes it easy to generate professional-grade, quality QR Codes and smartphone optimized mobile landing pages that give new life to product packaging and labels across any market, in any industry. Use Qfuse to create effective Mobile Sites and Mobile Landing Pages in order to gain customers and manage lead capture. Use QR codes and mobile sites to drive efficiency in Maintenance & Repair Records, Operations & Instructions, Facilities Management, Regulatory Compliance, Inventory Control, or just for easy access to Emergency Contact information. 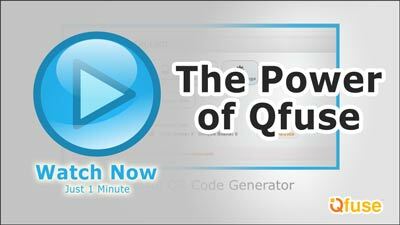 Qfuse provides an all-in-one platform that makes it easy to generate professional-grade, quality QR codes and landing pages that give new life to product packaging and labels across any market, in any industry. Qfuse makes it easy for you to market yourself and exhibit your professional portfolio and services. Simply place a QR code on your business card which links to your mobile site. Then you can provide information about your career, current client list, testimonials, etc--items you could never fit on 2x3in of cardstock. Qfuse provides businesses and non-profits the promotional tools needed to reach customers in new and exciting ways. Now you can employ advertising for your organization on any marketing collateral, small or large. Advertise using flyers, brochures, pamphlets, billboards, signage, or even tee-shirts. Use Qfuse to boost your success in PPC by more effectively managing your mobile landing pages and mobile ad campaigns. Maximize the value of your advertising campaigns in mobile search, pay-per-click, and mobile ad networks. Qfuse is not just for QR Codes, it is for any technology which allows you to link physical items/marketing to online content. You can manage 10s, 100s, or 1000s of NFC Marketing Campaigns. Use QR codes to evolve your posters and printed materials from simple static promotions to interactive smart posters that engage viewers and bring them from the physical world to the virtual world where they can take action. By printing QR codes on your posters viewers can scan the codes with their smartphone for a truly interactive experience.